Appeals against the extension of time for the Point Grey Channel and Marina have been fruitless. On 21 September the State published the Minister for Environment’s decision to extend the time limit for substantial commencement of the 2.5 kilometre navigation channel across the Harvey Estuary to the Dawesville Channel, to 1 August 2022. “The Peel-Harvey Catchment Council are bitterly disappointed at the decision”, said PHCC A/Chair Jan Star. “We do not understand the justification behind the State’s decision to extend the timeframe and we do not agree with the EPA Recommendations that supported the decision”. “This is the wrong decision and our Estuary and our community will suffer because of it” said Ms Star. 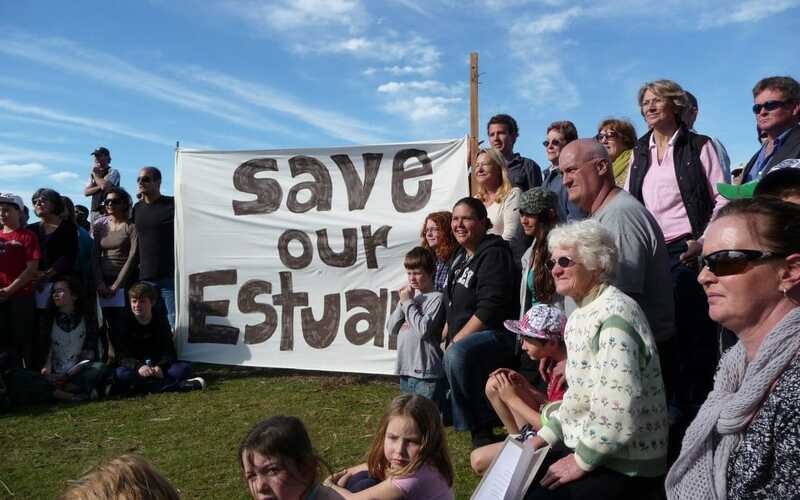 In July 2012 nearly 400 community members gathered on the Estuary Foreshore to protest the Channel and Marina because of the impacts it will have on our internationally significant Ramsar Wetland, including impacts on recreational and commercial fishing. It was one of the largest protests since the community campaign to protect the Creery Wetlands. In September 2012, a strong contingent also met with the then Federal Minister for Environment, and current Shadow Minister for Environment and Water, Tony Burke ahead of his conditional approval under the Commonwealth EPBC Act. In September 2017 the PHCC commented on the decision to extend the Time Limit of Authorisation for substantial commencement, articulating our evidence-based opposition to the proposal. The submission presented information that was not available when the 2011 application was considered by the EPA. This information outlined the implications of how the implementation of the Channel is likely to contribute to further deterioration of the Estuary. We are also concerned that the five-year extension appears to be based on the assumption that because, in the opinion of the EPA, no new evidence has been provided to show a deterioration in the condition of the Peel-Harvey Estuary between 2012 and September 2017, that similarly none will become available for a further five years to 1 August 2022. If new evidence does become available it would not be considered until that date should a further extension be sought by the proponent. This recommendation has been made despite the PHCC’s submission advising of the importance of investigations of hydrodynamic modelling, sediment quality (benthic in-fauna), seagrass coverage and fish populations that are currently being undertaken through the Australian Research Council Linkage Project Balancing estuarine and societal health in a changing environment. This research project, led by Murdoch University and University of Western Australia is scheduled to be completed in 2019/2020 and will fill some current knowledge gaps regarding the ecological health of the estuary. The contemporary Water Quality Improvement Plan, to be produced through the Regional Estuaries Initiative, and the Estuary Protection Plan, a 2017 Election Commitment made by the current Western Australian Government, are also scheduled for completion before 2020. The Australian Research Council Linkage Project and the two Plans will provide information pertinent to assessing the decline or otherwise in condition of the estuary. The PHCC’s previous concerns that the precautionary principle has been ignored in considering the health of the Peel-Harvey Estuary remain unabated. We reiterate that the absence of new information of some indicators of the current condition of the estuary should not be interpreted to mean that environmental conditions have not deteriorated since the initial assessment of the proposal. We also noted and addressed inconsistencies by the EPA and the proponent in assessing the condition of the Peel-Harvey Estuary based on existing monitoring programs that were not necessarily designed to assess the condition of the estuary in the proposed development envelope. The PHCC have been invited to Manila, to join with experts from around the world to develop a global Community Engagement project for the protection of our wetlands, which are vital for the 54 species of migratory and resident shorebirds that make the 25,000km round journey across 23 countries between the northern and southern hemispheres.